Carrie will show you how to paint realistic faces step-by-step, as she paints a young girl from start to finish. Follow steps for masking, underpainting, and layering, then work on bringing out the details of each facial feature with strong value contrasts. Learn about achieving luminous skintones, focusing on values to paint facial features with ease and more. 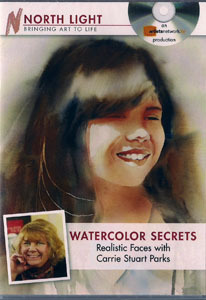 Carrie's friendly instruction and helpful tips will give you the skills you need to paint your own favorite faces. 100 minutes. DVD.